On Thursday Kortney and I picked up Gateway's FPD2485W - a 24" LCD display - to be used along with our future MacBook. The monitor had gotten extremely mixed reviews, from glowing to lambasting. An aside: Thinking back on it, the glowing reviews came from review sites, while the lambasting reviews typically came from (former) owners. That should tell you something immediately. I don't think you should typically trust someone who gets free stuff from companies for a living, they may be slightly biased. On the other hand, if you've dropped a significant wad of cash down for something and it doesn't meet your expectations, you're probably going to encourage people not to waste their time. 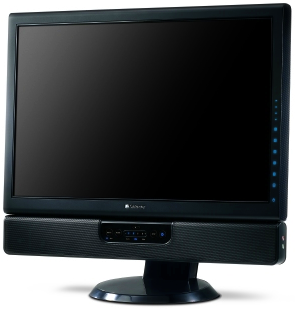 I wanted a monitor that could do at least 1080p, had great color reproduction, no noticeable banding, and no dead pixels if I could help it. After some color calibration, the FPD2485W was looking much better then it did out of the box, but when people say it has retina-searing brightness, they aren't kidding. Kortney's sunset background made us feel like we were looking into the sun. The first thing we did was drag a window over the sun portion of the background to shield ourselves from its intense rays. After setting up the monitor, I began looking for the obvious defects, namely the inverse ghosting and color banding often associated with this monitor. I was able to reproduce the color banding almost immediately, especially on a white-to-black gradient. Dragging this gradient between the display on our TiBook and the FPD2485W, it was obvious the Gateway was dithering (and doing a poor job at it). The TiBook has some very subtle banding (I've hadn't noticed it before tonight), but the Gatway looked awful; like the display could only display a handful of shades of gray. For a $500 TN panel, that may be acceptable, but I was looking for something nicer than that. Several posts on [H]ardForum mentioned the monitor's tendency to generate an inverse ghosting effect, especially when a white object was passing over a gray background. From that suggestion, it would appear that the monitor is overcompensating when transitioning from white to gray, causing the pixel to go black for an instance before correcting itself at the proper gray intensity. Using the test they suggested, I didn't see a significant ghosting effect, but several posts also said it gets worse when the monitor gets hotter. A monitor that deteriorates in heat isn't the best fit for Scottsdale. Our house is routinely in the low 80s, and probably won't drop below that before mid-September. This afternoon I was re-reading John Gruber's Full Metal Jacket and moved the Safari window to get at a Terminal window below. There it was, the ghosting. The display devolved into a smear of gray on gray pixels. If you can imagine wiping your hand across a fresh oil painting, you'd get an idea of what it looked like. Half a second later things had returned to normal, but the motion was jarring enough to break my persistence of vision, requiring me to rescan the screen. Oddly enough, I could only reproduce the ghosting using the DVI connection. The VGA connection didn't cause any ghosting, though banding was just as bad, if not worse. Did I mention this display was bright? I don't think I have particularly sensitive eyes, but this monitor is hard to look at. Friday morning I adjusted the brightness, contrast, and set up a color profile. On the VGA input right now, the brightness is set to 0, the DVI connection is set to 4 (yes, that's zero and four out of 100). The TiBook's display is set to its maximum brightness and the Gateway is still brighter. I've created an ICC profile for the monitor using SuperCal if anyone needs it (though you'd probably be better off getting a BenQ FP241W for about the same price then trying to salvage this monitor with a proper color profile). The FPD2485W is also very tempermental about displays which aren't in its frequency range. No, I don't expect it to attempt to show those displays, but when there is no valid signal coming in, you also don't have access to any of the on-screen-display menus. This caused me to have to restart the monitor several times this weekend to get a picture back. We bought the pictured speaker bar as well. The sound was decent, and the convenience of having the speakers up off the desk is nice too, but overall they felt cheap. For the price of the speaker bar, you can get a very nice set of stereo speakers. The negatives reviews seemed to be right on, and this monitor is making its way back to the store. The picture the FPD2485W produces is beautiful... except if that picture is moving, or has a horizontal or vertical gradient. For full disclosure, the model I had was manufactured in April 2007.